Chances are you’ve been there. The lone vegetarian picking at the side dishes, filling your plate up with the fringe offerings and brushing off comments from well-meaning (or particularly cantankerous) relatives and guests. Or worse, you’re faced with the unappetizing brown glob that’s otherwise known as Tofurkey. Choking down a slice with all eyes on you because Hey! You chose to stop eating meat! and you should be in food nirvana, right? No freaking way! 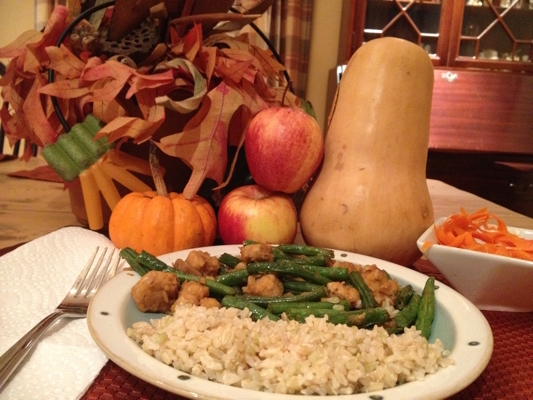 Thanksgiving doesn’t have to be painful or embarrassing for vegetarians (or the stricter variation– vegans). There are plenty of ways you can make this day not only fun but also avoid the inevitable turkey-coma! One of the strongest pieces of advice I can offer is be prepared for comments from relatives and guests. Yes, being a vegetarian today is easier than ever and has a lot more awareness, but you’re still bound to be a point of interest. To keep the conversation from becoming a game of twenty questions, or getting into a debate about why it’s wrong to eat meat! it’s best to remember the heart of the holiday. It’s not about putting someone on trial, nor should you have to be the brunt of negative comments. Thanksgiving is all about spending time with the people who are most important to you, and celebrating your time together while sharing lovingly prepared meals. So instead of making the holiday into an us and them showdown, take some time before the actual holiday to compose yourself. Think about all of the reasons why you’re a vegetarian and narrow it down to a few strong sentences or words. “I’m a vegetarian because I love animals and don’t want to add to their suffering.” or, “I’m a caring person and animals raised for meat aren’t treated kindly.” are both tried and true statements I’ve said to guests. By sticking to “I” and giving a short and sweet reasoning, you avoid any backlash or accusations of being preachy. Usually, I’ve found after speaking my piece the spotlight drifts off me and everyone goes back to their meals and conversation. If you have some particularly stubborn guests be a broken record. Your vegetarian statement is unassuming and at the same time has enough conviction to let them know that you’re serious. Many of the times guests I’ve met aren’t hostile, but instead are curious. Read their emotional cues and body language. If they seem genuinely interested by all means give some more details and share more of your experiences as a vegetarian. Just don’t bust out the gorey factory farming pamphlets– now isn’t the time to unleash an aggressive anti-meat campaign. Food is the center of Thanksgiving, despite traditional offerings being a vegetarian doesn’t mean you have to miss out on good food. Whether you’re a guest or hosting your own Thanksgiving there are an abundance of tasty meals you can put together that celebrate the season. The recipes below are not only quick and easy but they travel well, keep well, and can be reheated. However, if you’re unable to cook and bring your own meals, it’s crucial to let the host know ahead of time about your dietary needs. Be polite and offer up some suggestions of a meal or two you would appreciate. If that idea of that makes you too uncomfortable reach out to other attendees– call one of them up and see if they can lend a hand with bringing along some vegetarian food. Remember, it’s the spirit of Thanksgiving that matters, not who does and doesn’t eat the turkey. Easy-to-print version of these recipes can be found here. This recipe is great because it can be eaten as a stew or you can kick it up a notch and dollop some mashed sweet potatoes on top. Actually scratch that. It’d be a crime not to include sweet potatoes in some form with this recipe– even if that just means plopping a baked sweet potato down next to this! The veggies are really versatile as well. Feel free to add mushrooms, squash or other fall pickings. Put 1 teaspoon of olive oil in a large pot and turn to medium heat. Once it’s warmed saute the onions in the oil with a pinch of sea salt for 4 minutes. Add the other teaspoon of olive oil and the garlic, herbs and spices. Saute for another 5 minutes. Pour in the carrots, parsnips, lentils and broth. Bring to a boil and cover the pot. Once it’s a rolling boil, lower the heat to a simmer and let it cook for 25 minutes. If the lentils aren’t softer and the broth isn’t absorbed enough at this time, simmer for a few more minutes. Once the lentils are cooked, stir in the Worcestershire sauce and frozen peas. On the lowest setting possible, let the stew sit, covered for another ten minutes. *Some Worcestershire sauce has anchovies or fish in them, be sure to read labels. This side dish was a huge hit last Thanksgiving. Even when I doubled the recipe there weren’t any leftovers! Keep that in mind if you know you’ll have a lot of hungry guests on your hands! Cut the brussels sprouts to the size you prefer– either halves or quarters depending on how big your sprouts are. Pour them into a large bowl and stir the remaining ingredients into them. Line a large baking tray with foil and spray it liberally with olive oil cooking spray. Spread the brussels sprouts onto the tray and pop it in the oven for 15 minutes. Turn the tray and flip the brussels sprouts and put back in the oven for another 15 minutes. By now they should be browning and caramelizing, flip them again and stick back in the oven for another 5 to 10 minutes, until they get to your liking. Once they’re done roasting there are two options: serve them immediately, or set them aside and let them come to room temperature before putting them in the fridge and reheating them in the oven later. The latter method is the one I prefer because the flavors are enhanced more as the sprouts sit! * Be sure that it’s genuine maple syrup and not “breakfast” or “pancake” syrup. You can also use grade A if you have that, but grade B has a more “mapley” flavor. This is fabulous on salad greens. Roasting up some maple-cinnamon butternut squash and serving it on a bed of mixed greens with some chopped toasted nuts and in season fruits like chopped apples, pears, or even dried cranberries makes this a memorable side salad (or main course). In a mixing cup or small bowl, stir together ingredients with a fork and slowly drizzle in the grapeseed oil. If you want to keep the dressing from separating feel free to add up to a tablespoon of dijon mustard– but that will change the flavor profile of this a little bit. What would Thanksgiving be without pie?! This apple pie was another hot sell and beat out the competition on the dessert table spread–it was gone before the evening! Preheat oven to 425. Combine all filling ingredients together in a large bowl. In a separate bowl, combine the dry ingredients for the crumble topping. Don’t add all of the melted margarine or oil all at once. Add it gradually as you swish together the dry ingredients so you get nice sandy clumps you may need more or less so be attentive. Pour the filling into your pie pan then layer on the crumble topping. Cover the pie with a large sheet of aluminum foil that you tuck loosely around the pan so the top is completely covered. Be sure to poke several holes in it so it will let the steam out. Put the pie on a baking sheet (in the case of any spills and for easy removal in general!) and pop it into the oven for 20 minutes. Then, take the pie out of the oven and take off the foil shield. Lower the oven to 350. Put the pie back into the oven for another 30 to 35 more minutes. If you notice it getting very brown and bubbly take it out sooner. Once it’s baked to your liking, put the pie dish onto a cooling tray and let it sit for about a half hour before serving. Or, let it cool to room temperature and cover and refrigerate. This pie is great cold, and is a cinch to reheat for guests if you’re not serving it right away. It also could make a nice day-after-Thanksgiving breakfast if there are any leftovers!